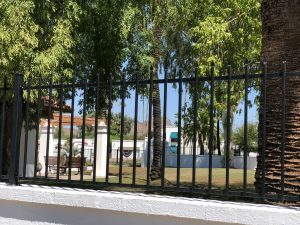 The Hillcrest community in Phoenix was facing a common problem: local kids were constantly jumping the fence to enter the neighborhood’s pool area without permission or supervision. This presented several concerns for the community’s residents, including the threat of theft or vandalism and the risk that a child could drown in the pool, thus exposing the community to liability. While the pool area was enclosed by an attractive white block wall, it clearly required a more effective security solution. The Hillcrest community leaders consulted DCS Pool Barriers in order to discuss their options for pool fencing. 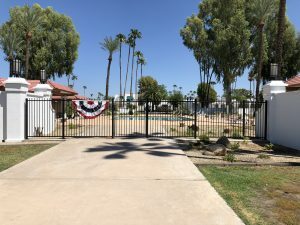 After visiting the property and reviewing the community’s needs, goals, and style, the professionals at DCS Pool Barriers determined that the best solution would be to install wrought iron security fencing on top of the block wall surrounding the pool area. We designed, manufactured, and installed the fencing, which has security stamped pickets that make it very difficult for anyone to jump the fence. In addition to the shape of the pickets, wrought iron offers a security advantage because it is highly durable and resistant to bending, breaking, or other types of damage that would allow it to be breached. To further ensure strength and quality, DCS Pool Barriers uses premium-grade steel when creating our wrought iron products. Although security was the primary goal of the Hillcrest community’s new pool fencing, style is also an important consideration with any major addition to a property. Fortunately, wrought iron has a naturally elegant aesthetic that enhances the style of nearly any home, business, or neighborhood. The sleek black wrought iron fencing that we installed at the Hillcrest community looks particularly eye-catching in contrast to the white block wall beneath it. In addition, the fencing is galvanized, which means that it has been sealed with a protective zinc coating to ward off rust. This will help to ensure that the pool fencing maintains a “like-new” appearance for many years, even when exposed to the elements. Galvanized wrought iron products from DCS Pool Barriers carry a ten-year warranty, making them a reliable and cost-effective choice. Whether you are concerned about kids jumping the fence to enter your pool area or you simply want to improve the style and safety of your pool, the team at DCS Pool Barriers is eager to find the right solution for your property. We are experienced at working with residential and commercial properties, including hotels and apartment complexes, and can create custom wrought iron pool fences and gates in a wide variety of styles. 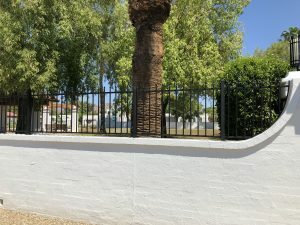 Call us today at 623-825-7700 or contact us online at https://dcspoolbarriers.com/contact-us/ to request a free estimate!